You can discard this card; Special Summon 1 of your “Thunder Dragon” monster that is banished or in your GY, except “Thunder Dragonhawk”. If this card is banished, or sent from the field to the GY: You can shuffle any number of cards from your hand into the Deck, then draw the same number of cards. You can only use 1 “Thunder Dragonhawk” effect per turn, and only once that turn. Thunder Dragons aren’t done on Pojo CoTD just yet, we’ve got another week of these awesome monsters, and it starts with Thunder Dragonhawk. Discard Dragonhawk to Special Summon a different banished or in your graveyard Thunder Dragon monster. Handy first effect considering these monsters get effects off being banished and you will be doing a lot of that. If Dragonhawk is banished or sent from the field to the grave (banished more likely considering the level six 1800ATK stats) you get a Magical Mallet for your hand. Hand fixing effect without the addition of another card to facilitate it is really good. Dragonhawk can help you Special Summon a Thunder Dragon that may be harder to Special Summon because of its level, then fix your hand to gain you more advantage by firing off more Thunder Dragons. If you had another copy of a Thunder Dragon monster that you’d activated that turn, then you lose out on a monster to use since they are all once per turn. A card being reviewed later in the week, Gold Sarcophagus, can trigger any Thunder Dragon straight-away and that is huge for any of the Thunder Dragons to activate their banish effect. Every deck would like a hand-fixing monster option that doesn’t require another card to run. Week two of the two Thunder Dragon weeks we are doing, so I’m going back to the main deck to look at Thunder Dragonhawk. Dragonhawk is a Level 6 LIGHT Thunder with 1800 ATK and 2200 DEF. ATK is a little low, but DEF is good enough, and LIGHT and Thunder are good. You can discard Thunder Dragonhawk from your hand to Special Summon 1 Thunder Dragon in your GY or that is banished. Since this is a Thunder monster using its effect in the hand and you are summoning a Thunder monster, this is an immediate Colossus assuming you had a Thunder Dragon in the GY or banished, which is highly likely. If this card is banished or sent from the field to the GY, you can shuffle any number of cards from your hand into the deck and then draw the same number of cards. So basically it is Magical Mallet without the likely minus unless you banished this off Gold Sarc, which there are better cards in the archetype to banish off that. If you drew into two of the original Thunder Dragons or two Thunder Dragondarks (hint for tomorrow :P) you can shuffle the extra copy back to get some more useful cards while being able to get the most value out of the mentioned cards. This can also unbrick a hand if need be, so using Gold Sarc for this isn’t the worst thing and you can play more useful cards than Magical Mallet. You can only use one Thunder Dragonhawk effect per turn and only once that turn, but you are most likely focused on that effect to summon a Thunder Dragon, so that’s fine. 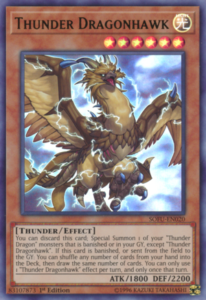 Thunder Dragonhawk is another three of in the Thunder Dragon deck and important along with Thunder Dragondark when splashing it as an engine. Art: 4/5 Didn’t know dragons had feathers. Opening Thunder (Dragon) week deux is Thunder Dragonhawk…Light, Thunder, Level 6, and 1800/2200 attack and defense, respectively, of which neither should impress you. So, discarding this card lets your Special Summon one of your Thunder Dragon Monsters, so long as it’s removed from play or resides in your Graveyard, and isn’t the Dragonhawk itself. We like this. We saw last week how cyclical these cards are, especially in discarding, and the engine(s) does(do) have a removal aspect as well. The secondary effect here is a Draw/Replace effect. If Dragonhawk is removed from play or sent from the Field to the Graveyard (with no stipulation as to how or by which player, again, we like) to shuffle any number of cards from your Hand back into the Deck and Draw the same number of cards vis a vis the magic card ‘Magical Mallet’. This card is just as versatile, and even more actually, than some we looked at last week. I am still a bit sour at the low attack and defense, so you likely aren’t going to use Dragonhawk to attack or defend, but it does plenty else to make up for it. Also to note, as shouldn’t surprise you, you can only use an effect once per turn, and you can only use one per turn. Still a really good card. Art: 4.5/5 I kinda feel more lightning than thunder here, but the Hawk or at least bird presence is familiar here, merged with the Dragon I suppose. Nice colors and detail anyway.